This article is about the shape. For the cough tablets, see Throat lozenge. For the heraldic element, see Lozenge (heraldry). "◊" redirects here. For other uses, see Diamond (disambiguation). A lozenge (◊), often referred to as a diamond, is a form of rhombus. The definition of lozenge is not strictly fixed, and it is sometimes used simply as a synonym (from the French losange) for rhombus. 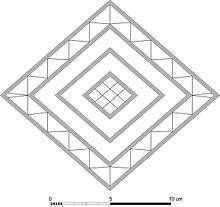 Most often, though, lozenge refers to a thin rhombus—a rhombus with acute angles of less than 45°. The lozenge shape is often used in parquetry and as decoration on ceramics, silverware and textiles. It also features in heraldry and playing cards. Sown fields in an open field system of farming. 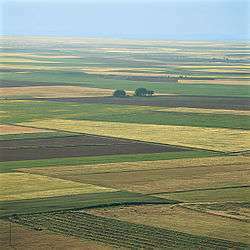 The lozenge motif dates as far back as the Neolithic and Paleolithic period in Eastern Europe and represents a sown field and female fertility. The ancient lozenge pattern often shows up in Diamond vault architecture, in traditional dress patterns of Slavic peoples, and in traditional Ukrainian embroidery. The lozenge pattern also appears extensively in Celtic art, art from the Ottoman Empire, and ancient Phrygian art. The lozenge symbolism is one of the main female symbols in Berber carpets. Common Berber jewelry from the Aurès Mountains or Kabylie in Algeria also uses this pattern as a female fertility sign. In 1658, the English philosopher Sir Thomas Browne published The Garden of Cyrus subtitled The Quincunciall Lozenge, or Network Plantations of the Ancients where he outlined the mystical interconnection of art, nature and the Universe via the quincunx pattern. He suggested that ancient plantations were laid out in a lozenge pattern. 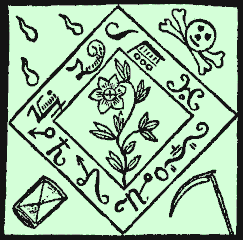 Lozenges appear as symbols in ancient classic element systems, in amulets, and in religious symbolism. In a suit of playing cards, diamonds is in the shape of a lozenge. In IBM 026 punched card code it is ⌑ (12-8-4), DOS code page 437 (at character code 4) and Mac-Roman. The TeX command for the lozenge is \lozenge. In modal logic, the lozenge expresses that there is "possibility." For example, the expression expresses that it is possible that is true. 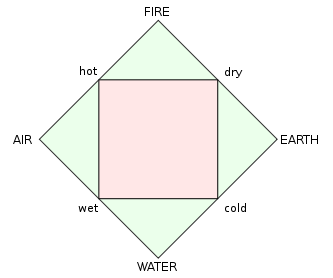 In axiomatic set theory, the lozenge refers to the principles known collectively as the diamond principle. 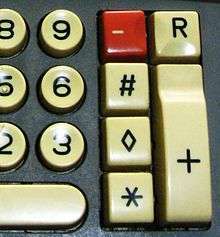 On equipment, especially calculators, the lozenge is used to mark the subtotal key. It is standardized in ISO 7000 as symbol ISO-7000-0650 ("Subtotal"). 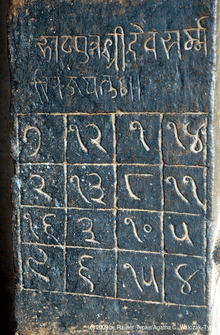 Similar, the (square) lozenge (⌑), part of the BCDIC code, was often used on tabulation listings to indicate second level totals in banking installations in the 1960s. During the First World War, the Germans developed Lozenge-Tarnung (lozenge camouflage). This camouflage was made up of colored polygons of four or five colors. The repeating patterns often used irregular four-, five- and six-sided polygons, but some contained regular rhombi or hexagons. Because painting such a pattern was very time consuming, and the paint added considerably to the weight of the aircraft, the pattern was printed on fabric. This pre-printed fabric was used from 1916 until the end of the war, in various forms and colours. The lozenge in heraldry is a diamond-shaped charge, usually somewhat narrower than it is tall. A mascle is a voided lozenge—that is, a lozenge with a lozenge-shaped hole in the middle—and the rarer rustre is a lozenge containing a circular hole. A field covered in a pattern of lozenges is described as lozengy; a similar field of mascles is masculy. Cough tablets have taken the name lozenge, based on their original shape. According to the Oxford English Dictionary the first use of this sense was in 1530. In Finland, the lozenge is associated with salmiak, through Apteekin Salmiakki. Thus, the lozenge is commonly called salmiakkikuvio "salmiak shape". The pattern is often used even if the candy is not actually lozenge-shaped. To implement 10 U.S.C 773, the Secretary of the Navy has prescribed the following distinctive mark for wear by members of military societies which are composed entirely of honorably discharged officers and enlisted personnel, or by the instructors and members of duly organized cadet corps. The distinctive mark will be a diamond, 3½ inches long by 2 inches wide, of any cloth material. A white distinctive mark will be worn on blue, green, or khaki clothing; and a blue distinctive mark will be worn on white clothing. The distinctive mark will be worn on all outer clothing on the right sleeve, at the point of the shoulder, the upper tip of the diamond to be ¼ inch below the shoulder seam. 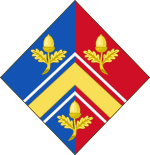 The lozenge is used in the Army, Marine Corps, and Air Force on the insignia of their respective First Sergeants. It is also used in the cadet programs of Army ROTC, Army and Marine Corps Junior ROTC, and the Civil Air Patrol as rank insignia of cadet officers corresponding to the military pay grades of O-4 to O-6 (C/Major, C/Lieutenant Colonel, and C/Colonel). 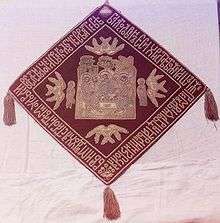 In Finnish military ranks, the lozenge is found in the insignia of conscript officer students (one lozenge) and conscript officer candidates (two lozenges). The lozenge (technically a mascle) can be used on public roadways in the United States and Canada to mark a specific lane for a particular use. The lane will usually be painted with a lozenge at a regular interval, and signage will be installed to indicate the restrictions on using the lane. This marking is most often used to denote high-occupancy vehicle lanes or bus lanes, with accompanying signage reading "◊ HOV LANE" or "◊ BUS LANE" and giving the requirements for a vehicle to be accepted. Prior to 17 January 2006, lozenges could also be used to mark bicycle-only lanes, often in conjunction with a bicycle icon. In New Zealand and Japan, a lozenge marked in white paint on the road indicates an upcoming uncontrolled pedestrian crossing. A hollow lozenge is also used in the signage of waterways to identify a hazard. A cross is placed in the lozenge, dividing it in four, to mark a restricted area. Several flags feature lozenges, including the Brazilian flag, which contains a yellow lozenge at the center. One official flag of Bavaria is entirely made of blue and white lozenges. ↑ "Lozenge - from Wolfram MathWorld". Mathworld.wolfram.com. 2015-07-22. Retrieved 2015-08-11. ↑ Welters, Linda (1999). Folk dress in Europe and Anatolia: beliefs about protection and fertility. Berg. pp. 16–21. ISBN 1-85973-282-8. ↑ Sams, Gilbert (1994). The early Phrygian pottery. Science Press. p. 151. ISBN 0924171189. ↑ Berber Carpets of Morocco: The Symbols Origin and Meaning, by Bruno Barbatti, ACR Edition, ISBN 978-2-86770-184-9. ↑ Moore, Charles (1988). The Poetics of Gardens. The MIT Press. p. 161. ISBN 0262631539. ↑ "Geometric Shpaes" (PDF). Unicode.org. Retrieved 2015-08-11. ↑ "The IBM 026 Key Punch". Columbia.edu. 2003-12-31. Retrieved 2015-08-11. 1 2 Mackenzie, Charles E. (1980). Coded Character Sets, History and Development. The Systems Programming Series (1 ed.). Addison-Wesley Publishing Company, Inc. p. 99. ISBN 0-201-14460-3. LCCN 77-90165. ISBN 978-0-201-14460-4. Retrieved 2016-05-22. ↑ Valtanen, Esko (1990). DOS-OPAS. Teknolit. p. 649. ISBN 952-90-1220-9. ↑ "German Lozenge Camoflage". Wwiaviation.com. Retrieved 2015-08-11. ↑ "FHWA MUTCD - Phase-In Compliance Periods Bookmark Update". Mutcd.fhwa.dot.gov. Retrieved 2015-08-11.